Hudson Valley New York weddings pics are surrounded by incredible natural scenes at any of the many venues that are located in the area. The Buttermilk Falls Inn and Spa is a favorite location for many Hudson Valley New York Wedding Photographers because of the beauty of the grounds that make up the venue. The inn is a perfect place for an outdoor wedding ceremony and tented reception in the warmer months. This image depicts a gorgeous Buttermilk Inn outdoor wedding ceremony, with the flora surrounding the event in full bloom. 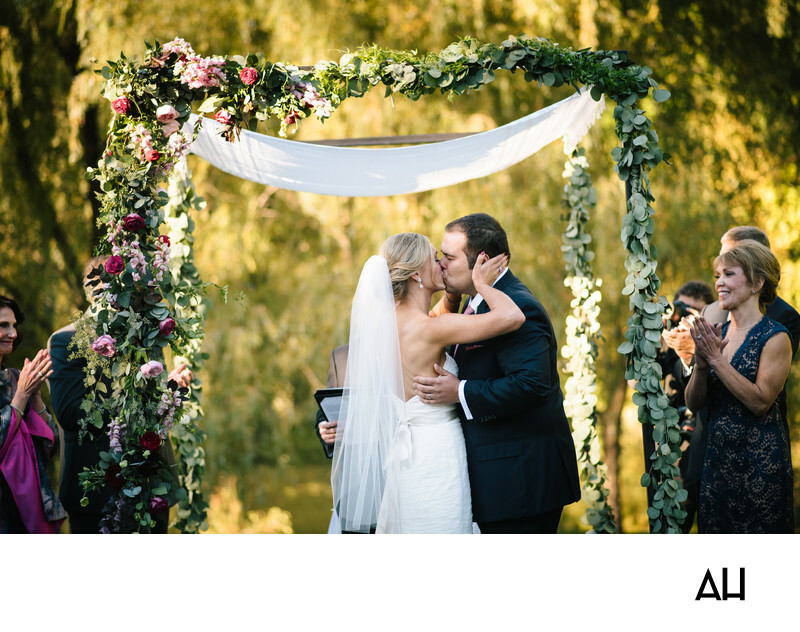 The colorful photo focuses on the bride and groom, who have just finished saying their marriage vows and now share their first kiss as husband and wife. Guests around the couple clap and look on affectionately. It is a tender, lovely moment between the newlyweds, made even more magical by the setting of their nuptials. The image looks like a scene from a storybook, with the bride and groom caste as a princess and her prince. The background of the photo is covered in bright green foliage, giving the impression that the ceremony took place deep in the heart of an enchanted forest. At the center of the picture, the couple stand beneath a canopy that is made up of a white cloth and poles that are covered by vines of vibrant roses. The roses spill over the top corners of the canopy and flow down to the earthen floor in waterfalls of green, pink, and red. The moment appears to be the happily ever after at the end of a fairytale, but it is really just the beginning for this wonderful couple. Hudson Valley wedding pics have so many great venues to photograph at including Belltower Venue, Oak Hill, FEAST at Round Hill, Sixty5 on Main, Tappan Hill Mansion, Senate Garage, Falkirk Estate and Country Club, Cedar Lakes Estate, The Palladian Barn, and The Art Barn.